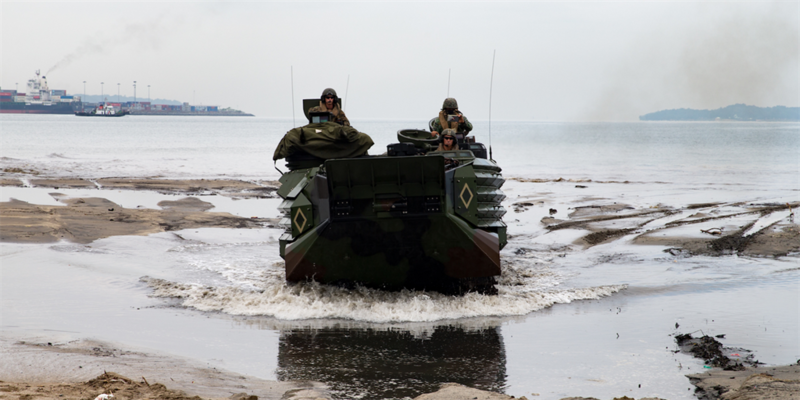 US Marines and the Philippine marine corps land on the beach in assault amphibious vehicles during KAMANDAG 2 in Subic Bay, Philippines, October 3, 2018. Japanese troops are in the Philippines for an exercise with Filipino and US troops. They brought armoured vehicles with them, marking the first time Japanese armour has landed on foreign soil since World War II. The US stressed that the exercise is not directed at anyone, but it comes amid heightened tensions with China. 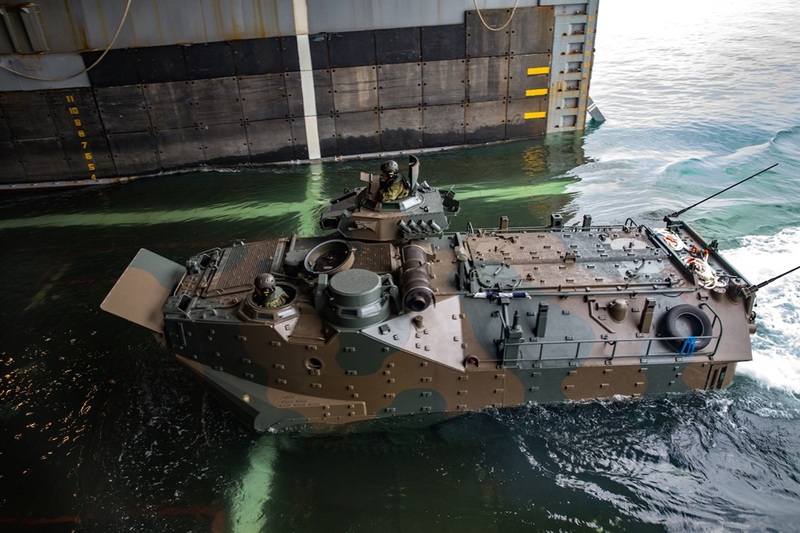 A small contingent of Japanese troops and armoured vehicles engaged in military exercises with the US and the Philippines in the Philippines on Saturday, assisting in a humanitarian role during an amphibious exercise simulating recapturing territory from a terrorist group. A total of about 150 troops took part in the landing on Saturday. Fifty Japanese troops, unarmed and in camouflage, followed four of their armoured vehicles ashore, moving over beach and brushland while picking up Filipino and US troops playing wounded. Japanese Maj. Koki Inoue stressed that Japanese personnel weren't involved in the combat portion of the exercise but added that the drills were the first time the Japanese military's armoured vehicles had been used on foreign soil since World War II. After being defeated in that war, Japan adopted a pacifist constitution. The Japan Ground Self-Defense Force prepares to embark on the USS Ashland in assault amphibious vehicles during KAMANDAG 2 in Subic Bay, Philippines, October 3, 2018. "Our purpose is to improve our operational capability, and this is a very good opportunity for us to improve our humanitarian assistance and disaster relief training," Inoue said, according to AFP. The exercise, called Kamandag - an acronym for the Tagalog phrase, "Kaagapay Ng Mga Mandirigma Ng Dagat," which translates to "Cooperation of Warriors of the Sea" - started in 2017 and has focused on counterterrorism, disaster response, and interoperability. This year's iteration of the exercise runs from October 2 to October 11, and the US has said it is not directed at any outside power. "It has nothing to do with a foreign nation or any sort of foreign army. This is exclusively counter-terrorism within the Philippines," 1st Lt. Zack Doherty, a Marine Corps communications officer, told AFP. US Marine Corps Lance Cpl. 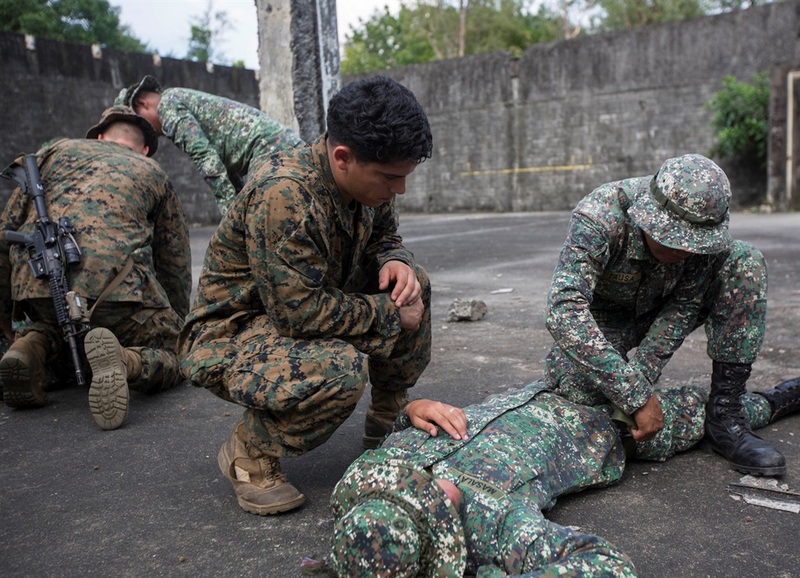 Jovanny Rios guides a Philippine marine in a combat life-saver drill during KAMANDAG 2, in the Naval Education Training Center, Zambales, Philippines, October 2, 2018. 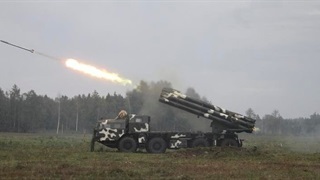 But the drill's timing and location put it in the middle of simmering tensions between China and its rivals in the region. The landing took place at a Philippine navy base in the province of Zambales on the northern island of Luzon. The same base hosted an expanded annual US-Philippine military exercise earlier this year. About 130 miles west in the South China Sea is Scarborough Shoal, a group of rocks long administered by Manila until China seized it after a stand-off in 2012. China has ignored a 2016 ruling by an international tribunal that rejected its expansive claims in the South China Sea and found that it violated the Philippines' territorial rights. China has built up other islands and reefs it claims in the South China Sea, adding military outposts and hardware. It has not done that on Scarborough, and doing so would have strategic implications for the US and the Philippines. Manila has said such activity would be a "red line." The exercise also kicked off after a series of shows of force by US and Chinese forces in the East and South China Seas, including numerous flyovers by US bombers and a close encounter between US and Chinese warships. Japan's presence was one of several recent firsts for that country's military, which has looked to increase its capabilities and readiness. Earlier this month, British troops became the first non-US military personnel to be hosted by Japan for military exercises, joining members of the Japanese Ground Self-Defense Force for Exercise Vigilant Isles. 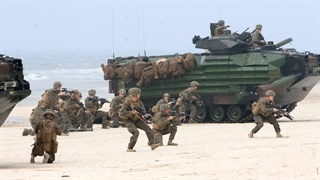 This spring, Japan stood up an elite Amphibious Rapid Deployment Brigade for the first time since World War II. Japan has its own territorial dispute with China over islands in the East China Sea, and that force, which has carried out several exercises already this year, would likely be called on to defend those islands.